One by one the holidays are coming and going as we reach the end of another wonderful year. Each holiday comes with different celebrations but the one constant throughout them all is a meal. There is always an amazing meal that has everyone looking forward to the holiday. Hosting the holiday celebration usually means it’s up to you to make that special holiday meal. 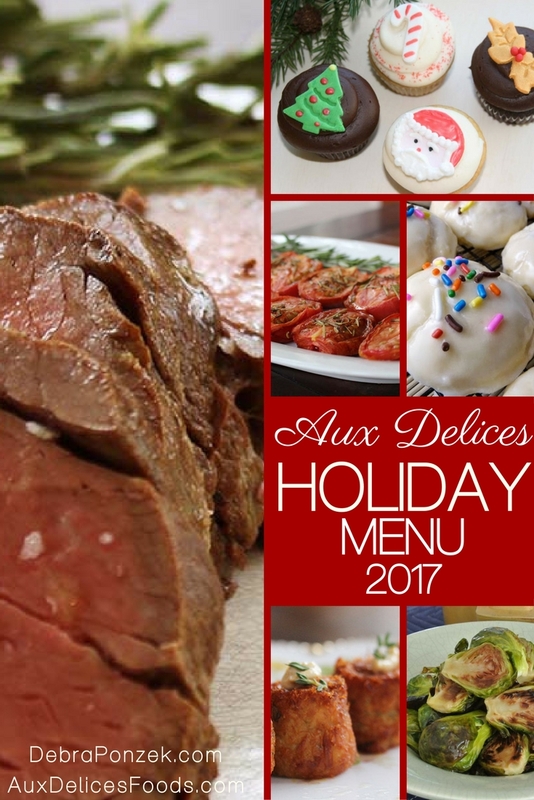 Luckily, you don’t need to struggle to put together the best holiday recipes because Aux Delices has done that for you with the Aux Delices Holiday Menu 2017. 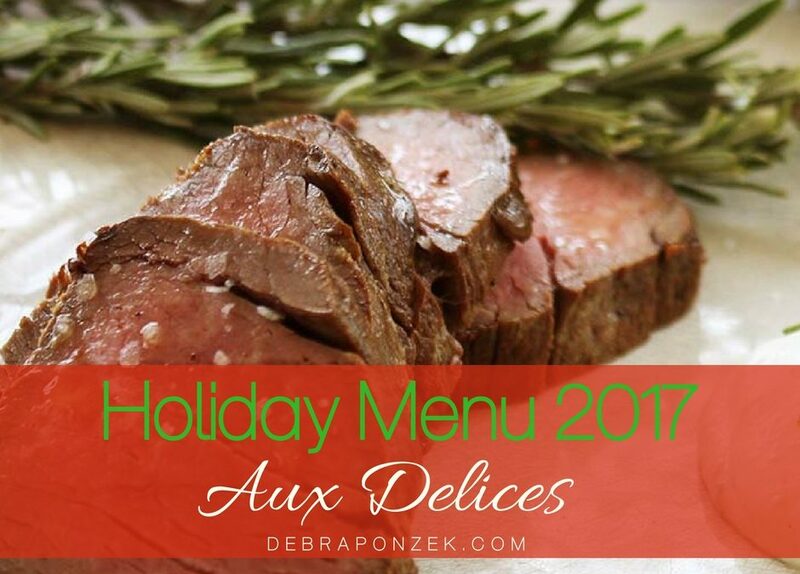 Let the Aux Delices holiday menu 2017 help you put together a holiday meal that family and friends will remember for years to come. Starting a meal on the right foot is very important. Soups and hors d’oeuvres are perfect starters because they’re light, delicious and easy to clear off the table when it’s time to serve the main course. For the holidays, Aux Delices has roasted squash and pear soup along with many different salads and small bites. Things like baby arugula salad, a cheese and fruit platter, coconut shrimp, baked brie en croute, pigs in a blanket and more can help set the stage. If you’re looking for something a little more classy, a smoked salmon platter is available or a wild mushroom in phyllo dish. You can even order jumbo shrimp cocktails with Aux Delices housemade cocktail sauce. When it is time to serve the main course, it will need some side dishes to compliment the flavors. 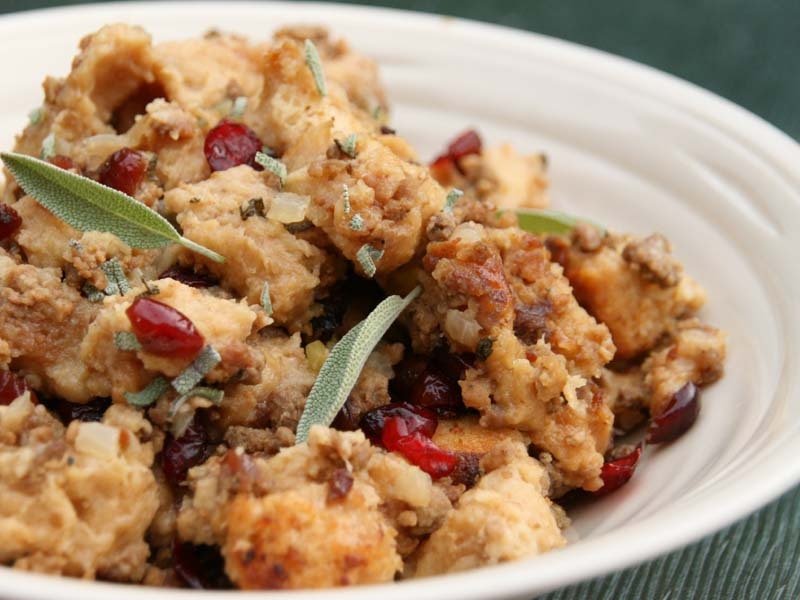 Aux Delices stuffing is always a great choice for the holidays but it’s not your only option. Order a pint or two of mashed potatoes and add rich turkey gravy. Other side dishes available include creamed spinach, cranberry relish, creamy potato gratin, haricots verts, roasted baby brussels sprouts, sweet potato puree, steamed asparagus and oven roasted Roma tomatoes. All of these sides can be ordered by either the pound or the pint. There are many main dishes for holiday meals. The more traditional offerings are available at Aux Delices like turkey or spiral cut hams. Turkey options include roasted or raw and in different weights from 10-over 20 pounds. Roasted turkeys will need to be reheated and the raw options come with an aluminum roasting pan with herb butter and cooking instructions. The spiral cut hams come from Garret County Farms and are glazed in honey and orange. The hams are 8-9 pounds and must be ordered whole. Turkey and ham are common meats to enjoy during the holidays but they aren’t the only options at Aux Delices. Raw or herb roasted whole filet mignon can grace your tables or beef wellingtons ordered individually. 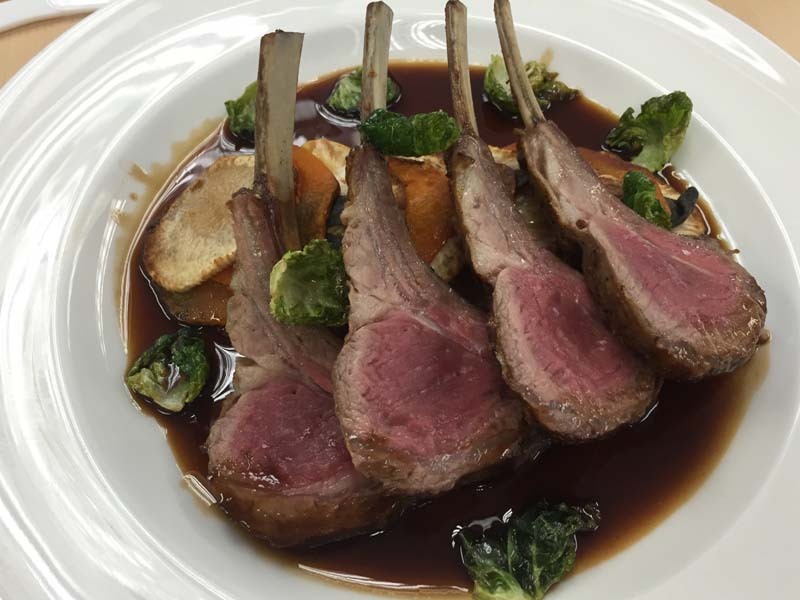 A rack of lamb makes for a beautiful holiday dish and salmon filets make things more exciting. Of course, chicken breast with truffle cream sauce is a must-try and filet mignon tournedos, wrapped in bacon with red wine sauce are extremely classy. Not everyone wants to go with the classics and prefer something a little lighter but still delicious. 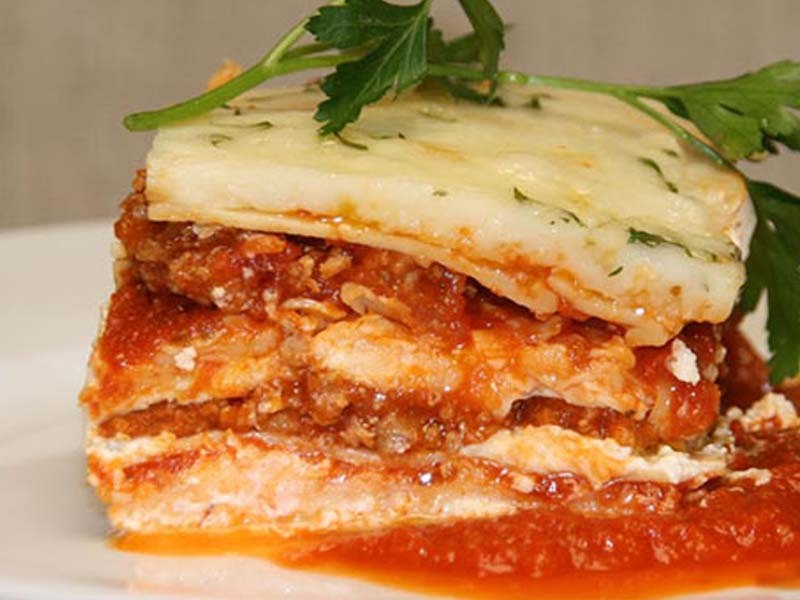 Meals like vegetable lasagna or lasagna bolognese. Kids in the family would love macaroni and cheese of chicken tenders. While you’re preparing the meals, the family may not want to sit without anything to nibble on. A ham and gruyere quiche or spiced nuts may help. 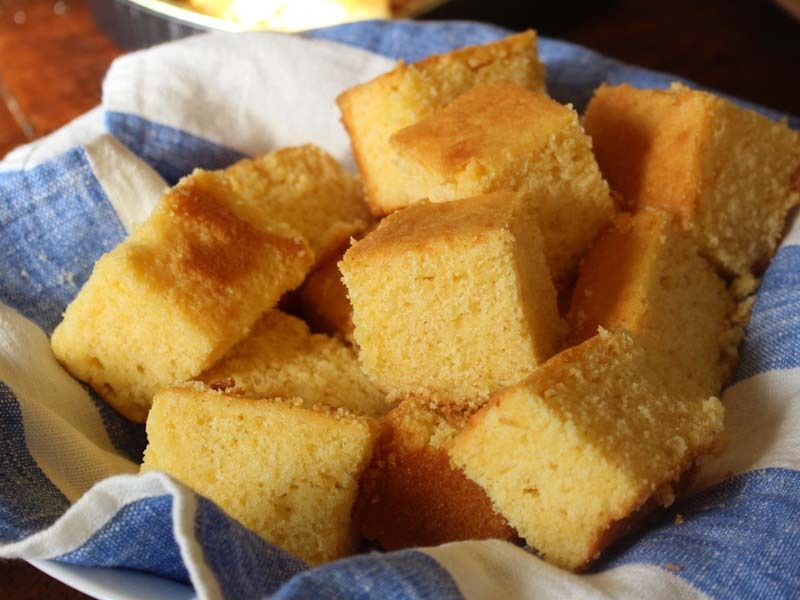 A pan of cornbread would go nicely with the soups or starters and some red wine sauce would go great with the entrees. When the meal is finished and the family is enjoying company, it’s time to add something sweet to the table. 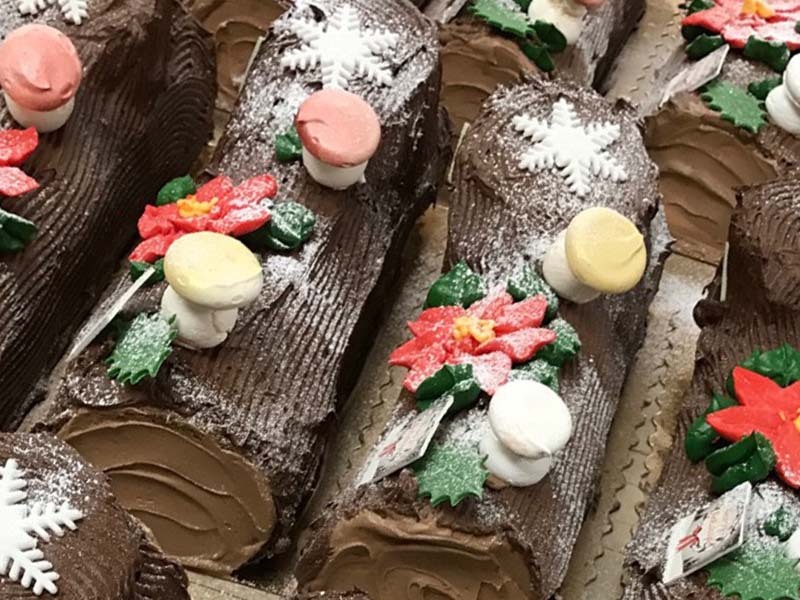 During the Holidays, Aux Delices gets festive with desserts like sticky toffee puddings, Buche de Noel (Yule Log), or fancy decorated cupcakes. You can go with the classics like apple or pumpkin pie, cookies, or mini cinnamon baked doughnuts. You can also go chocolatey with the homestyle Christmas Tree cake. All of these options can be ordered separately and by the pound, pint or piece count or you can go with a prixe fix menu. The prixe fix menu costs $350/ea. And serves 8-10 people/ ea. The menu comes with all natural spiral cut ham with roasting pan and honey orange glaze, baked brie en croute, mini crab cakes, pigs in a blanket, baby arugula salad with goat cheese, dried cranberries, sweet almonds, champagne vinaigrette, oven roasted Roma tomatoes with herbs de Provence, haricot verts with roasted cherry tomatoes, mashed potatoes, chocolate homestyle Christmas tree Cake, and assorted Aux Delices cookies. The deadline to put in your orders to Aux Delices for your holiday event is at 5:00 pm on Dec. 19, 2017. Get your orders in today!